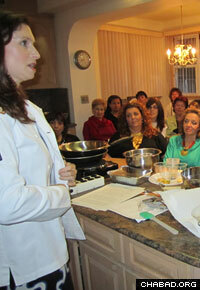 Pastry chef Paula Shoyer leads a cooking demonstration at Chabad-Lubavitch of Sea Gate in Brooklyn, N.Y. When Paula Shoyer, the Chevy Chase, Md., pastry chef and cookbook author was invited to conduct a cooking demonstration for a group of enthusiastic foodies at a Brooklyn, N.Y., Jewish center, she never expected to be standing in the very kitchen where as a little girl she first learned the art of baking. “After the house was sold, it changed hands a couple of times,” explains Shoyer of the Oceanside residence at 3844 Lyme Avenue where Shoyer and her late grandmother, Sylvia Altman, baked traditional Jewish desserts from scratch. Shoyer, author of The Kosher Baker: 160 Dairy-Free Desserts From Traditional to Trendy, learned that the family home now housed Chabad-Lubavitch of Sea Gate. “My grandmother introduced me to pareve desserts in that kitchen,” Shoyer fondly recalls, referring to baked goods that per Jewish dietary law can be served with either meat or dairy dishes. Prior to last month’s cooking class, attended by 45 women in the Sea Gate community, Shoyer hadn’t visited the home for 17 years. Ironically, Shoyer, who grew up in Long Island amidst a slew of kosher bakeries and attended a local Orthodox yeshiva, never intended on becoming a rising star in the world of kosher cakes and cookies. Upon graduating from Brandeis University in 1986 as a pre-med major, she entered law school at American University and became a successful environmental attorney. It wasn’t until Shoyer and her husband, an international trade lawyer, moved to Geneva, Switzerland, that her epicurean interests took flight. Paula Shoyer grew up in the Oceanside home. But Shoyer, who adheres to Jewish dietary laws, soon ran into a culinary quandary. Word of mouth spread and the budding pâtissière was suddenly in demand, baking desserts for friends’ birthday celebrations and dinner parties in and around Geneva. “The next thing you know, I’ve got a catering business,” says Shoyer, who also taught cooking classes in French to raise money for Jewish organizations. After returning to the States, Shoyer launched Paula’s Parisian Pastries, giving instruction in pastry making and Jewish cooking to kids and adults – including those with special needs – in the Washington, D.C., area and throughout the country. Soon after, cookbook author Susie Fishbein enlisted Shoyer to edit the best-selling Kosher by Design Entertains and Kosher by Design Kids in the Kitchen. The Kosher Baker, which includes gluten-free, vegan and kosher for Passover recipes, was inspired by Shoyer’s desire to meet the gastronomical needs of not only Jews, but people with other dietary restrictions, such as diabetics. 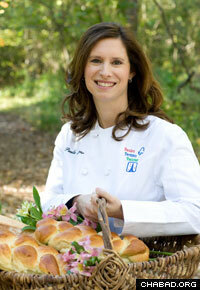 Paula Shoyer is the author of "The Kosher Baker: 160 Dairy-Free Desserts From Traditional to Trendy." Since Kosher Baker’s publication, Shoyer has fielded countless letters from grateful fans who’ve rediscovered their Jewish roots through her traditional yet on-trend recipes. “I get emails from people all the time telling me that I’ve gotten them in the kitchen and connected them to their grandparents,” she reveals.